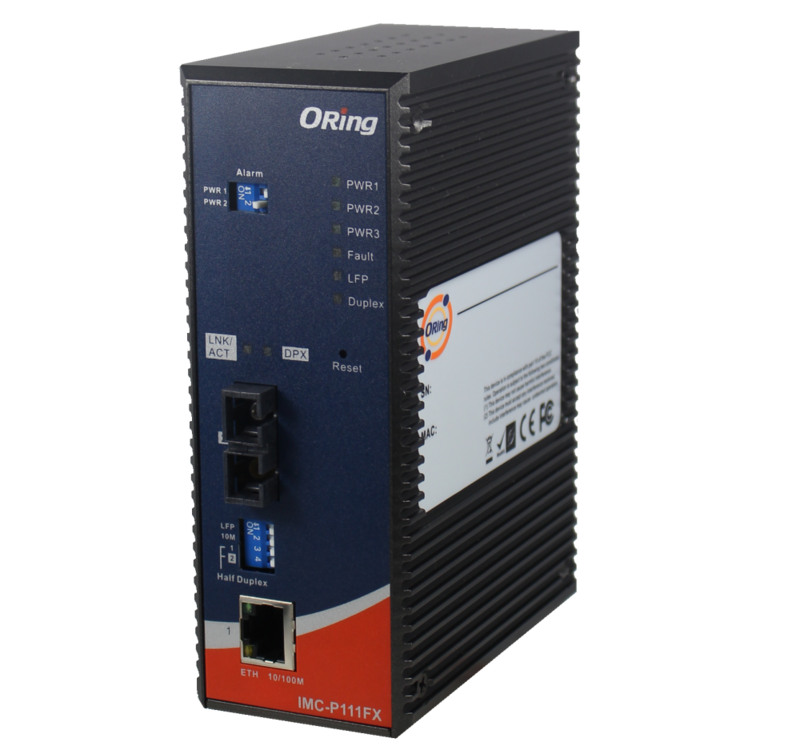 IMC-P111 series is a cost-effective solution for the conversion between 10/100Base-T(X) and 100Base-FX interface, it allows you to extend communication distance by optical fiber. IMC-P111 series are designed for power substation application and rolling stock application, fully compliant with the requirement of IEC 61850-3 and IEEE 1613. IMC-P111 series supports MDI/MDIX auto detection, so you don’t need to use crossover wires. IMC-P111 series with wide operating temperature range from -40 ~ 85OC and accepts a wide voltage range power inputs, so it is suitable for harsh operating environments. IMC-P111 series also support the LFP (Link Fault Pass-through) feature. When one side of the link fails, the other side continues transmitting packets, and waiting for a response that never arrives from the disconnected side. Use the DIP-Switch to enable the LFP function, then IMC-P111 series will force the link to shutdown as soon as noticed that the other link has failed, giving the application software a chance to react to the situation. Therefore, the IMC-P111 series is reliable media converter and can satisfy most demand of power substation and rolling stock application. IMC-111 series also support the LFP (Link Fault Pass-through) feature. When one side of the link fails, the other side continues transmitting packets, and waiting for a response that never arrives from the disconnected side. Use the DIP-Switch to enable the LFP function, then IMC-111 series will force the link to shutdown as soon as noticed that the other link has failed, giving the application software a chance to react to the situation. Therefore, the IMC-111 series is reliable media converter and can satisfy most demand of operating environment.